I’m a dog mom. That means that my dogs Cassius and Roxy are like children to me. I cook most of our “people meals” at home but I’ve never made homemade dog food or treats. We’ve always fed our dogs very high quality food so I never really felt it was necessary. During a recent visit to Texas, my mom and I got to talking about a recipe for dog treats she created for her doberman pinscher Suzy. Suzy had not been feeling well and was off her food, but she really loves my mom’s homemade cookies. I decided today to make a batch of dog cookies. It’s based on my mom’s recipe but I used all organic ingredients, and instead of store bought ground turkey, I used up the organic turkey offal that has been sitting in my freezer since Thanksgiving. This cookie recipe is very simple to make, and most of the ingredients I had on-hand without a trip to the market. 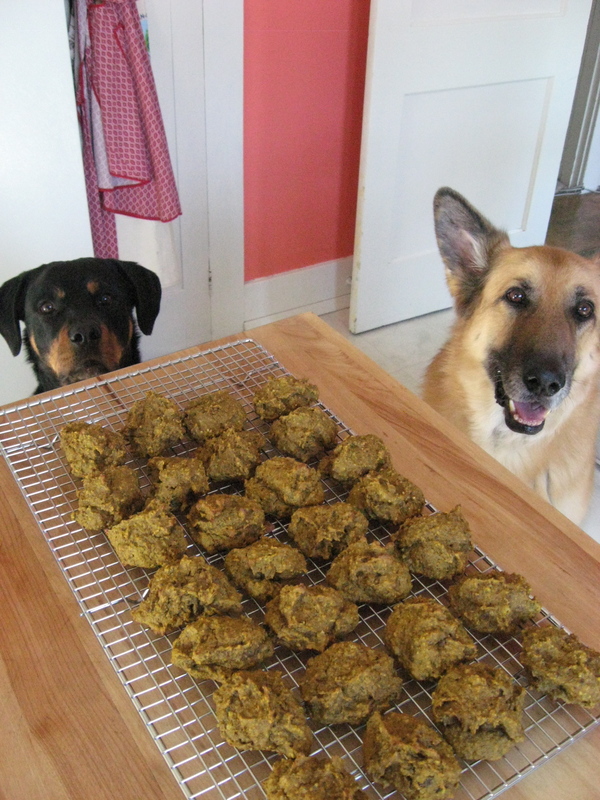 The dogs were willing and enthusiastic taste testers so this recipe seems like a winner. Heat the oven to 350 F. Combine all ingredients in the bowl of a food processor and process until ingredients are pureed. Chill the mixture in the freezer for about 5 minutes. Line a cookie sheet with parchment paper. Using a small ice cream scoop, spoon out mounds the size of a heaping tablespoon and place onto the sheet -making sure the mounds are about an inch apart. Bake for 10-15 minutes until golden brown on the bottom. Transfer to a wire rack to cool. The cookies will also harden as they cool- but not too much. Depending on the size of your cookie sheet, you may need to bake the cookies in two batches. Allow the cookies to completely cool and then transfer to a airtight container or baggie and store refrigerated. Your dogs will thank you. Thanks for this recipe! I have all the ingredients at home now so I’m going to try it! I’m sure my fur baby will love them. My dogs loved them! As long as you have a food processor, it should be dirt simple to make.